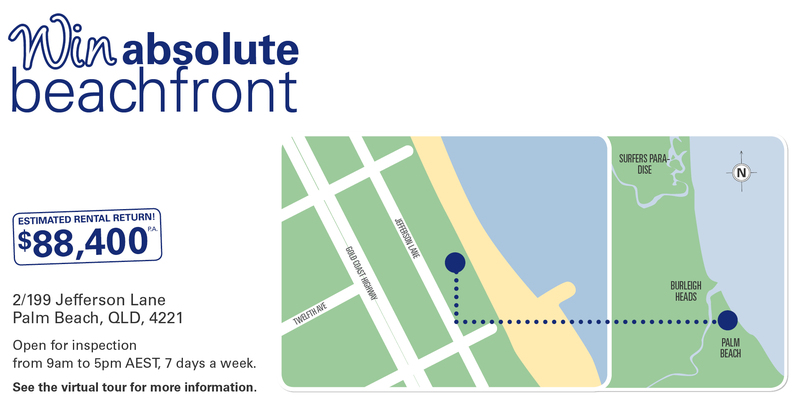 Win an Absolute Beachfront on Millionaire Row! Be one of the lucky few in the world who enjoy absolute beachfront living on the Gold Coast’s beautiful Palm Beach! The lucky winner of this prize will enjoy the peaceful ambience being a resident of ‘Millionaires’ Row’ provides, as well as spectacular views of Palm Beach from the living areas and master bedroom. Enjoy absolute beachfront living with breathtaking views of Palm Beach and the peaceful ambience being a resident on ‘Millionaires’ Row’ provides. 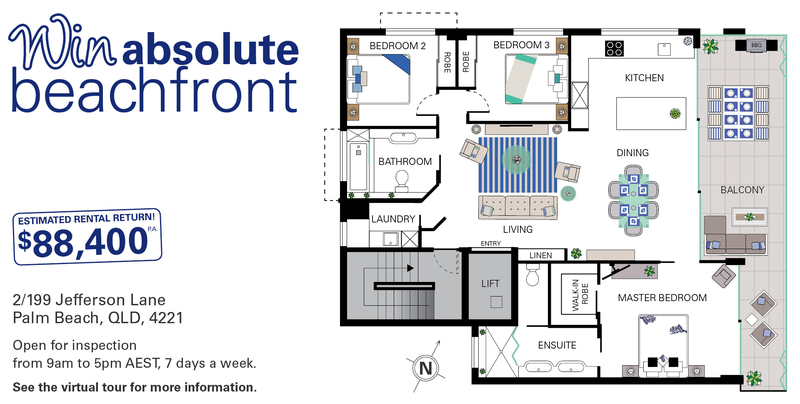 A light filled, spacious 3 bedroom, 2 bathroom home with an open plan design that provides a contemporary, fresh living space. Host family and friends on your expansive balcony with fully retractable shutters making al fresco entertaining possible all year round. Wake up to the sound of the ocean and enjoy stunning views from your master bedroom, which includes a walk-in robe and ensuite. Live steps away from sinking your feet in the sand and a short stroll to shops, cafes and restaurants. If you choose to rent this apartment, you could enjoy an income above the average Australian’s. $68,756 worth of furniture and electrical appliances.